“Storm” has been a theme in my life this last week. A week ago today I was frantically cleaning my house, preparing meals for my family and packing for a quick blogging trip to Arkansas. It was the day before my period was expected, and I figured “oh what the heck! I’ll take a pregnancy test for the fun of it, maybe I won’t have to pack feminine products!“. I took the test, and stared down at it unknowingly. I saw a fuzzy pink line appear and then fade away as the test line turned a vivid dark pink line, like it’s supposed to. The test was not positive, so I put it on the window sill of our master bathroom and went about putting the kids to bed, as Jay was out working in the fields preparing for the upcoming harvest season. After the kids were snuggled and tucked in their beds after a story, song and prayers, I grabbed my phone and texted my sister-in-law Laura that I was “definitely not pregnant”. Laura has been excitedly cheerleading for us to have another baby, as we have been sitting on the fence of having one last baby to add to our family for the entire year. I have gone through seasons on both ends of the spectrum; sometimes my mind changes hourly about adding another life to our family. Needless to say, Laura was disappointed in my news that I wasn’t pregnant. I replied to her that I actually wasn’t as relieved as I thought I might be that I wasn’t pregnant…but that I also knew I would definitely be panicking a bit and feeling anxious if the test showed two pink lines vs just one. I went back to the bathroom to clean up a bit, glanced over at the test on the window sill “just in case” and low and behold…another pink line had appeared. At least, I thought so. I started second guessing myself. Was that really a positive test!? Was that an evaporation line? A false positive? Though faint, a positive pregnancy test. I started wondering if I could really handle three children. I felt a little numb with the shock and semi-surprise of being pregnant with our third baby. I even felt guilty running rampant with emotions, glancing over at a picture on our dresser of an almost 3-year-old Braden happily snuggling his new 5-day-old brother Ethan. I wondered if I would rock their world too much by adding another baby to the family. I even cried. Real tears. Worried tears. Anxious tears. I felt all the emotions. I was happy, but scared. Excited, but nervous, because it was all happening so fast and seemingly so soon. I had a bad day with the boys that day, I was stressing out over my trip to Arkansas and all the things I had to get done and I think I know I was a bit short with the boys that day, but we did have a good bedtime as I tried to make up for my shortcomings of the day. Needless to say, my emotions had emotions that day. I then texted my husband asking when he would be home. He told me an hour, and I just couldn’t wait that long, so I called him and said “well, I think I’m pregnant“. I knew I was pregnant. He completely took me by surprise and told me how excited he was. It made me feel so at ease and calm knowing that he was excited, because in all honesty that was not my first reaction. For our other two pregnancies, they were as planned as they could possibly be and I was over-the-moon happy, whereas Jay admitted he felt guilty for being scared and not excited off the bat. He then told me that our kids are the absolute best part of our life and having another can’t be a bad thing. Jay completely calmed me down and got me excited too. He told me that this was in God’s hands. And it is—it truly, always is. After I got off the phone with Jay I walked out onto our deck. There was a storm rolling into the south of us and it looked so pretty. I’ll always remember it, but now I wish I had taken a picture to really remember it. I prayed to God that He would take my anxiety away and to bring joy into my heart about this. I then heard God say to me “I’ll take care of the storm for you“, and I was at peace. I felt my emotions storming, certainly not my circumstance and He helped level me out and brought me peace and hope for the future. The next day I was in Arkansas and bought the most expensive pregnancy test I’ve ever purchased, because I just had to confirm the pregnancy with an absolute—not a faint line. A $17 cab ride and a $15 digital pregnancy test later (with $0.75 Canadian on the American dollar!) I went back to my hotel room to confirm without a doubt that “YES+” I was pregnant and due with an early April baby. I excitedly texted Laura and Jay and starting really looking forward to this spring baby. I even got to share the news with my brother and sister-in-law in person when I returned home on the Friday as I saw tears of joy well up in their eyes at the news of another niece or nephew to love, but admitting to them that it was “still really early”…as most expecting moms are trained to think. On Friday evening as I was getting ready for bed, I knew something was wrong. I could just feel it in my gut (perhaps literally as well as figuratively). I went to the bathroom and saw what no expecting mom wants to see on the toilet paper: a reddish/pink streak. I had spotting with my first pregnancy at 6 weeks and even a bleed at 28 weeks and everything was okay. But I had never had anything this early and I just felt that something was wrong with our baby. I prayed that night that God would take care of our baby and that He would heal it if something was wrong, but also that I prayed that He would give me strength and that I would try to understand if He had to take our baby because something was definitively wrong. I also had the thought cross my mind of “I’m going to be another statistic. I’m going to be a 1 in 4“. Sadly, at 3:30 that morning when one of the dogs woke me up, I would find out that I was going to be the 1 in 4 women who experience early pregnancy loss. I was bleeding. I was having a miscarriage and losing our baby. Even though on one level I knew it was coming, on another I was completely beside myself. How could it happen? I had two healthy pregnancies and two healthy boys to prove it. I had never had a miscarriage, so why now? Why me? I waited until an ‘appropriate’ time to test with Braden because I wanted to be certain it was positive. I just knew I was pregnant with Ethan from almost the moment that it happened, tested much earlier than with this one…and it all went fine. What happened to me with my third pregnancy is called a chemical pregnancy/early miscarriage. Most women won’t even know they had a miscarriage when a chemical pregnancy happens, I only did because I tested on the early side. Luckily my mom was up so I got to call her to talk to her about everything that was happening. It was hard to say it out loud and tell my mom that I was pregnant, but that I was miscarrying and losing the baby. Somehow I managed to get back to sleep and I told Jay, my brother and his wife that morning. I cannot believe how attached I got so quickly and the pain of searing loss I feel over our two week old developing baby. If not for the pain of the loss, then for the pain of “what could have been”. I also never knew how many of my own family and friends have lost pregnancies. It happens more than you know, and I have found the thing that has helped my healing so much is talking about it with other women that it has happened to. Everyone is different, copes differently and grieves differently, but I could not be where I am right now without the help of these women’s counsel. I reached out to trusted people to pray for me and for Jay—thank you to our prayer warriors, we feel and appreciate your prayers. I know deep down that something was wrong with our baby, and as they say it was “not meant to be”. If our baby would not have been viable later on, I am truly thankful that God took our baby as soon as He did. I try as hard as I can to be thankful in every circumstance and lean on and trust in God’s plan for my life. I am thankful that I now know for certain that I want to purposefully try for another baby, but that if that is not in God’s plan for us, that I will find not only peace in that—but joy. Joy and thankfulness that we are already blessed with two amazing boys and so much more in our lives than we deserve. I find peace and hope knowing that God wrote my story long before I was even born. I look back on my life, and in particular the last two years, and see my story unfolding and the pieces of the puzzle fitting together. I don’t always understand, or quite frankly like, how the pieces fit together and the order that they go—but I do trust in it. It helped me get through my Dad’s death and it will help me get through this loss. God knows everything about me, so who better to talk to about all of this than Him? My father-in-law texted me his sympathies, as they were away on vacation and he said: “May God wrap you in His arms and be your portion. May He fill you with his peace in the midst of the storm.” (emphasis mine). Storm: the recurring theme of my last week. He told me to run to the Psalms, so I did. How comforting Psalm 139 is. If you have struggled with loss or if you are struggling with loss, I hope in any minor way my words have helped. It is so therapeutic (for me) to talk with women this has happened to for support and grieving, but it has also helped me to write it all down. In light of Mark Zuckerberg sharing the news of their pregnancy and the importance of talking about miscarriage, I thought I would add in my own recent experience. Thank you for reading. Looking forward to hearing about the arrival of your newest babe. Our third son arrived last spring (during seeding of course) and we couldn’t be more thrilled. 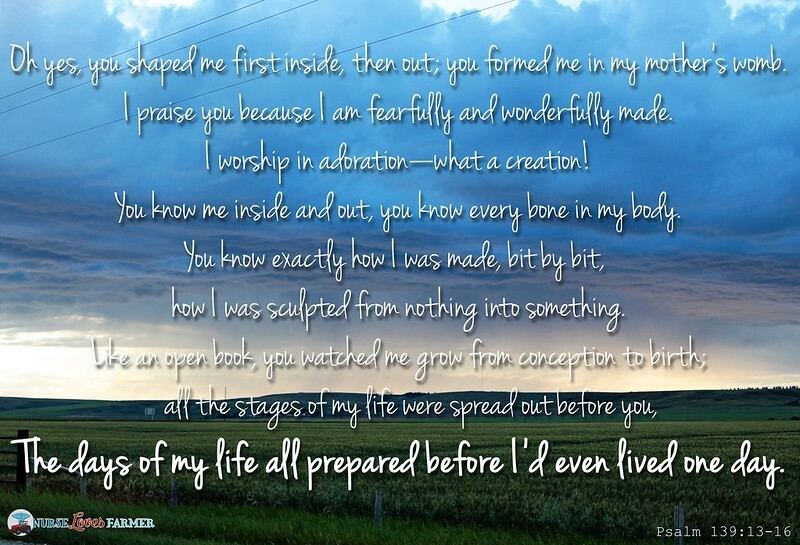 This really touched my heart as I, too, miscarried my third pregnancy. I was 11 weeks when I lost our baby. Thankfully we wait until I am 12 weeks before we tell anyone we are expecting. It was 4 years ago, but I still think of this baby everyday and know that God has a sweet, angel in heaven. God bless you and thank you for a beautifully written blog. I am so sorry for your loss. Thanks for sharing – your posts always touch my heart (I love your passion for ag), and I am so thankful that you have shared your pain in hopes of helping others. After our loss, I had no idea how I would ever heal, but time has allowed me to gain perspective, and God continues to show me that we were chosen to be blessed with these babies, even for a short time. Hold on to hope, and remember the beauty that comes after the storm – God will use this in ways you have yet to imagine! That means a lot, Liz, especially after the post I just published today. Thank you so much and I hope you continue to heal too. Thank you for sharing your story. God does help us weather the storms but they are still storms none the less that we each have to get through on our own terms. I went through almost identically the same thing. Third baby, on the farm. We planned for ‘him’ I tested early and we were so very excited. But I started bleeding around 6/7 weeks as well and something didn’t feel right. Had an ultrasound baby was growing well- happy and healthy. But bleed was still there.. So we didn’t tell a soul. Doctoring every week. Finally at 10 weeks we told our parents but said we were still staying quiet.. And 3 days later I had to call a cousin and ask her to come watch our other girls as we went into er so had to do the ‘we are pregnant but I think I’m loosing it..’ Thing as well. Spent all night in er with them saying everything was fine… Only to confirm the next morning we lost the baby. It is not easy and even writing this is hard still. We were thankful to have two beautiful healthy little girls to go home too and knew we wanted to try again. The next pregnancy was difficult as I was worried about everything after the loss, but thankfully i now sit here wth our beautiful healthy little boy! I wish you peace and strength in your time of difficulty and send love your way knowing you are not alone. You brought tears to my eyes, Trisha. Thanks for sharing your story, it means so much to me that so many women can share their experiences and we can help each other through it. Your story will mean a lot to women who have been in similar situations. Thank you for sharing. My boyfriends grandmother passed away a few weeks ago and there was something said at her funeral that really resonated with me (even as a non-religious person) that I hope will help you through a difficult time. "If He led you to it; He will lead you through it"
I'm very sorry for your loss, and remember you are loved! Thanks for sharing, Sarah. My good friend Micheal has been saying that to me since this happened and it really is comforting. I think it is good that you depended on God or it would be tougher. You definitely had every right to be attached to your baby and one day you will be reunited with that sweet little child. I am very sorry for the pain you have endured. I know a lot of people who have had miscarriages and it is something people should be more understanding of. So extremely sad. May He bless you again and carry you to full term the next time. Sarah, your story matters. Thank you for talking about it. Hugs. It’s hard. Even with all the conflicting emotions. For the record, your boys would be amazing big brothers. Don’t believe the lie that says you would be stealing from their childhood. You are loved mama and so are they. Thanks, Laura. I did let that lie slip into my brain and for a bit I felt immense guilt when I started miscarrying for believing that lie even for a split second. I know it's not true and I know it's not "why" I miscarried, but it makes me all the more excited to try (on purpose!) to add to our family and hopefully God will bless us with another healthy baby. My heart goes out to you Sarah. Thank you for sharing your experience, it is so important to open up communication about a tragedy so many of us know all to well. Oh, Sarah… this made me cry. I have had two of these 'chemical pregnancies' – both before Clara was born, and both within a few days of that first faint pink line. We tried for years to have a baby before Clara was born, and so I was doing a lot of testing early! I had debated telling people because we weren't yet 'certain', and everyone says you should wait to tell others about a pregnancy 'just in case' – and maybe some women prefer to do it that way, but after I bled both of those times, all I felt was an inescapable loss that I didn't feel like I could share with anyone. I thought about those babies for years – I still do, although the chaos of living children has made me forget how old they would have been now… I wish now that I'd told people right away – so I could have shared the loss, and been comforted in my pain – but when people haven't heard about the baby yet, it's hard for them to understand that you were already thinking about names, and how the child will fit into your lives. It only takes seconds for that baby to become completely your child – and it is completely devastating to lose that, even though I know too that likely there was something wrong with both of those babies, and that God's plan is best somehow. I'm so sorry you experienced this. My prayers are with you – and maybe soon God will bless you with a child you now know you're excited for! Thanks for sharing your own personal experiences, Samantha. I know that "only" a chemical pregnancy and miscarriage seems so little compared to miscarrying weeks and weeks and months down the road, and certainly heaven forbid a stillbirth, but it still was awful and hurt so much. I expected it…yet couldn't imagine what it would feel like. I started thinking of the future and names and all that stuff too. It's amazing how fast a bond forms. Thank you for you kind words and prayer. So sorry Sarah…I too know your pain and loss. The statistic is 1 in four, however as soon as it happens to you, it's amazing to find out just how many others have also experienced the same thing. You will always remember the day it happened (for me, Aug 20th….the day before my 5th wedding anniversary). Now, some 18 years later I say a special prayer on that day and smile knowing I have someone very special waiting for me in heaven. Hugs to you…your family and faith will keep you strong. I have a knack for remembering dates as it is, so August 1 and our due date of April 6 will always sting a little bit, but I hope we can also move on and celebrate another pregnancy and birth one day in the future. Thanks, Jenny. Sarah, thanks for sharing your raw emotions and feelings in this post. I am sorry for your loss and pray for strength and trust as you "weather the storm". I think it is great that more people are open to talking about these things now, then they did when even our mother's were having kids. When it comes to miscarriages or infertility issues – you never really know how many other people understand and are there for you. Thanks, Val. Even if this post helps 1 other woman talk about her loss, I'll consider it a 'win'. Thanks, Shannon. Much love to you too. My sincere sympathies to you!! I had two miscarriages between Jenna and Taylor and another between Taylor and Callie. You would have thought by then, it would be easier. It was not. I think about how different life would have been had those babies been born. I would not have Taylor and Callie. At the time, I questioned God. But…God knew the big picture. I was so thirsty for knowledge about WHY this happened. I could find nothing. The pain is real. The grief is something only you will understand. The excitement of another baby and loving that baby so soon after finding out is real. What I also know is that one day, I will meet those three babies. They’ll meet me when I enter Heaven. My heart aches for you and please know I UNDERSTAND! A lot of people will say the typical, “it happened for a reason”, etc. but it’s because they don’t know what else to say. What I wanted most was someone to cry with me, hug me, let me talk about what happened and say I love you. I love you!! As a general statement, I do believe "everything happens for a reason" but that answer still stings with something so sensitive and emotional as this. Luckily, thank the Lord I had my sister-in-law visiting and she had gone through the same thing before she had her 2nd child and it was nice to have a shoulder to cry on that knew exactly what I was going through. I texted my close friends and family to let them know and it's amazing how many of them confided that they too had miscarriages and that they knew how hard it was. Thank Jesus for the chance to be with our loved ones again. Love to you. I am sorry for our loss, Sarah. It was just over 21 years ago, we had our second miscarriage, at 3 & half months. This needed a D&C, and I was able to get through both of them, like you are trying to do, by believing that there was something wrong with these babies and God took them early. Oddly, those pregnancies were different than the ones I carried to term….no morning sickness or tiredness. I also believe there are 2 'girl angels' watching over me. Having raised boys – I know I could NOT have been a 'girl' mom! Take care of yourself, both mentally & physically. This is interesting because I’ve always said the 3 I lost must have been boys. I have 4 girls and I too knew there was something wrong. No morning sickness. Felt too good. I wonder if there's any science behind that because I've been following the story of dianawrote.com for years and she lost twin boys at 19 weeks and lost her baby boy to a rare heart condition 3 weeks after he was born and she has a healthy little girl and is pregnant again with another little girl. I would love to have a daughter one day, so I hope that's not the case, but I would be very happy with another boy or whatever God would bless us with. Thanks to you both. So very sorry for your loss. However, thanks for talking about it. None of ours ever made it past 10 weeks. Miscarriage is one of those things no one ever talks about, and if they do, no one wants to hear about it. I'm so sorry to hear that and thank you for reading. Oh Sarah, I am so sorry for your loss. What a rollercoaster of emotions you've experienced over the past week. While I have not experienced a miscarriage myself, and will not pretend to know what you're feeling, I have watched a couple of close friends go through this. After many conversations with them in the past, I think they might tell you to allow yourself time to grieve and to never let anyone diminish the loss that you feel. You are in my thoughts. It sure has been a rollercoaster of emotions, thank you for reading and the comment, Dara.